Japanese cuisine has a surprising amount of warm, comforting dishes that are popular with cooks looking to recreate the flavours of their childhood. 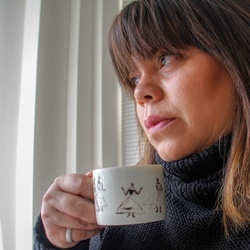 Rosana McPhee introduces us to some of the most popular recipes. The Japanese are an incredibly loyal and passionate nation when it comes to food. Listen to someone talk about visiting a certain region of Japan and it will almost always be centred around the local dishes that were on offer, and travelling to eat is all the rage. Many towns and cities are known first and foremost for their regional speciality, whether it be a type of fish, noodle, seaweed, tofu or dessert. Attentive preparation and meticulous composition are paramount in Japanese cuisine. Food is seen as an art form, and even the simplest dishes are often prepared by chefs who have trained for many years. The Japanese are very proud of their four very distinctive seasons and each one marks the beginning of more delicious offerings. 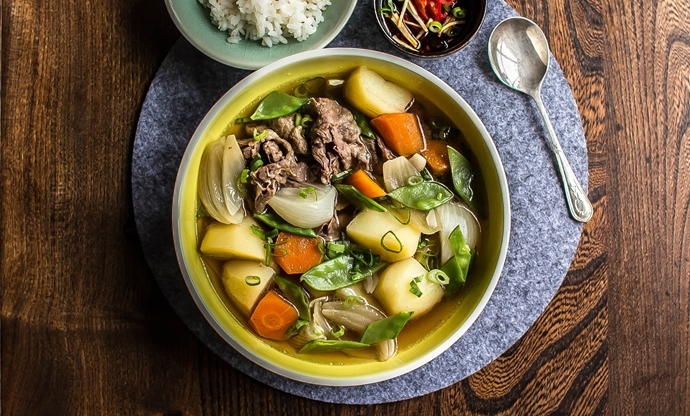 The country has its own catalogue of comfort food which is particularly popular, especially when hungry cooks are keen to recreate the dishes of their childhood. Here are just a few of the stews, soups and curries enjoyed in Japan. A traditional Japanese home cooked dish. Niku means meat and jaga is part of jagaimo which means potato, the two main elements of this recipe. The ingredients are gently simmered in a mixture of soy sauce, mirin, sake, and sugar, giving it a savoury yet somewhat sweet flavour. It is a comfort dish associated with childhood memories. This heart Japanese vegetable soup is more like a stew and can be considered a meal in itself when served with rice and pickles. Meat is also sometimes included for a more substantial dish. 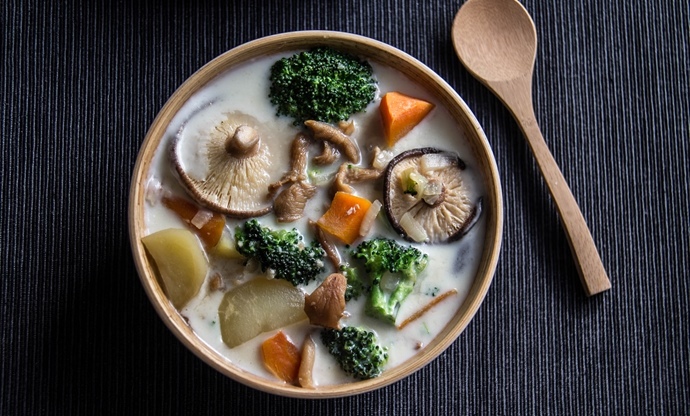 'Cream' or 'white' stew is a typical yōshoku dish, which refers to a style of Western-influenced cooking in Japan. 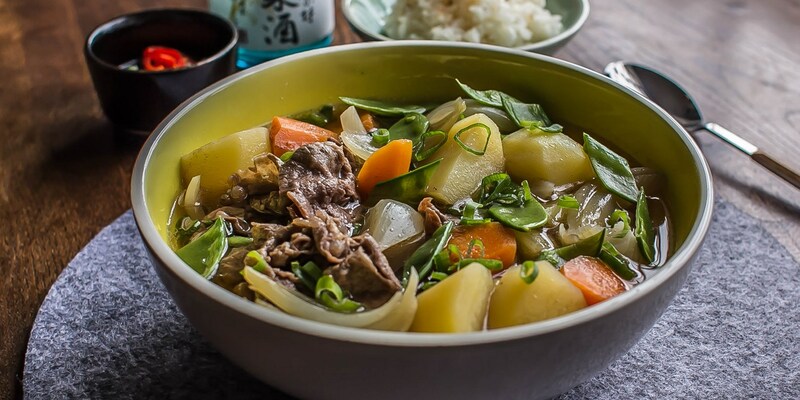 Simmered or braised dishes have been around Japan for centuries, but the concept of a milk-based stew appeared in Japan around the latter half of the 1960s. The usual ingredients are carrots, chicken and potatoes, served in a roux-based sauce. Miso soup is a classic Japanese dish that makes the most of miso, which is made from soybeans. It is made by mixing miso paste into dashi, or stock, and adding other ingredients. Common elements include miso and seaweed, tofu and wakame, carrots and daikon, potatoes and onions, nasu, okra, shimeji mushrooms, enoki mushrooms and Asari clams. 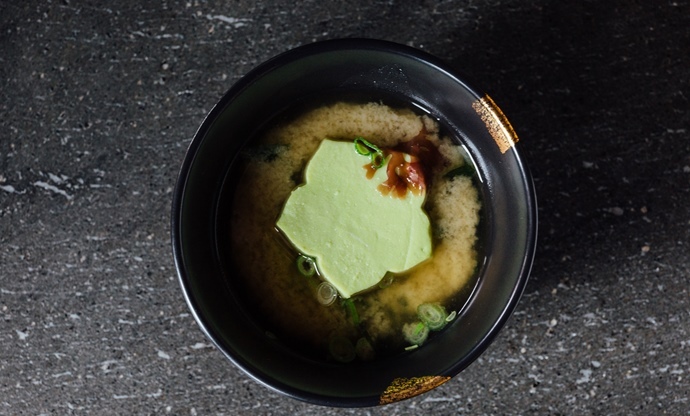 What makes miso soup so popular is how effortless, light and versatile the recipe can be. It's also very healthy and great for digestion, making it an everyday staple in Japanese homes. While miso soup outside of Japan usually follows the same recipe, there are actually many different varieties. Shiro (white), aka (red), shinshu (yellow) and mugi (barley) miso soups are found in different regions of Japan. 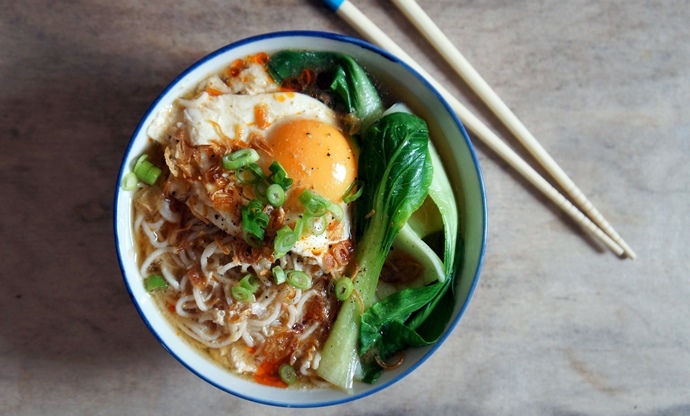 In its most basic form, ramen is a bowl of noodles in broth with a variety of other ingredients added on top. There are dozens – possibly hundreds – of regional ramens eaten all over Japan, but the most popular are seasoned with miso, salt (shio) and soy sauce (shoyu). There’s also Tonkotsu, where the broth is made from pork bones and gives it a milky white appearance, and seafood ramen, which is made with a rich seafood stock from a variety of shellfish. Dashi is a clear soup stock that forms the base of almost all Japanese recipes. It’s incredibly simple, with just kombu (dried kelp seaweed) and bonito flakes (dried, smoked tuna) boiled in water until fragrant. The main reason why dashi is used in so many recipes is because it is full of umami flavour. Vegetarian and stronger stocks made with dried sardines (niboshi dashi) are also quite common. Ton-jiru means pig or pork in Japanese. It is a rich pork and vegetable miso soup served with tonkatsu (fried pork cutlets). Suimono means 'things to sip', and refers to a clear soup. This is served at the end of a meal or as part of an elegant kaiseki (traditional) dinner after the starter or sashimi course and before the main. The basic Suimono recipe is exceedingly simple, but because of its very simplicity, it is hard to master. The flavours are so delicate and subtle that it is easy to go overboard with flavouring. The ingredients are fragrant herbs such as mitsuba and the rind of citrus fruits like yuzu. Presentation is also important for Suimono. 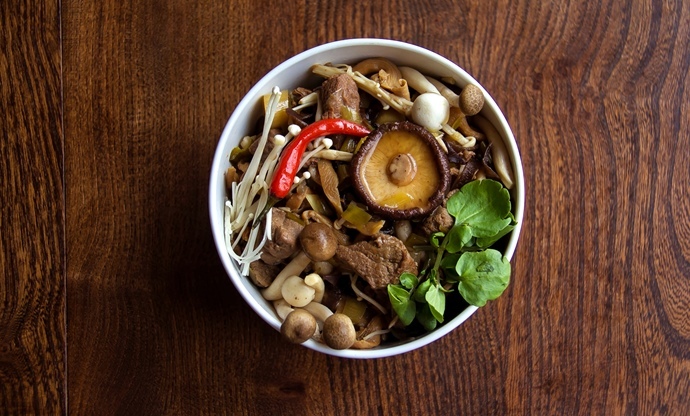 The ingredients should be cut into beautiful shapes and ideally served in covered lacquer bowls. The wow-factor of enjoying Suimono is the fragrance that is released when the lid is lifted from the bowl. 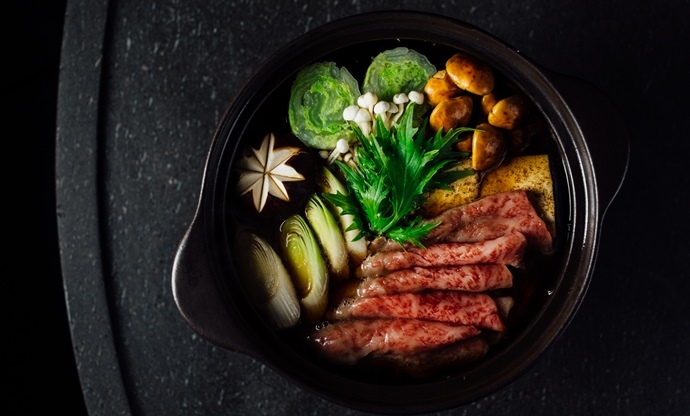 There are a few different forms of nabe, like Shabu-shabu, a type of Japanese hot pot where vegetables and thinly sliced meat are cooked in a boiling pot of dashi. It is a traditional Japanese dish that is generally enjoyed at home because of its simplicity. Family and friends gather around the table and cook their own food on a hot-pot over a naked flame as they enjoy each other's company. The very thinly sliced meat, seafood and vegetables are cooked while you eat, and the meat should only sit in the broth for as long as it takes to say 'shabu-shabu'; just a couple of seconds. Sukiyaki is another form of Japanese hot pot in a stew-like broth which is made of a mix of sugar, soy sauce and mirin. Vegetables, tofu, vermicelli noodles and thinly sliced beef similar to that of Shabu-shabu are cooked in the pot. Sukiyaki is enjoyed by dipping the cooked food into a bowl of beaten raw egg. The egg must be fresh as it will be consumed uncooked. This dish is most commonly enjoyed during the wintertime. What makes Japanese curry different from other curries is the way the sauce is cooked. It all starts with a flour-butter paste (roux), resulting in a creamy and thick curry sauce. The British introduced curry to Japan during the Meiji era (1868–1912) when India was under the colonial rule of British Raj and Japan opened its doors to foreigners and their goods. The dish became well-liked in Japanese homes after the development of an instant powdered curry mix in the early twentieth century, and its demand took off after World War II when the curry roux was introduced in cubes. The dish then became available in supermarkets and restaurants menus in the late 1960s. There are a wide variety of vegetables and meats used to make Japanese curry. The main vegetables are onions, carrots, and potatoes, with meats such as beef, pork, and chicken. Japanese curry is commonly served on top of rice. 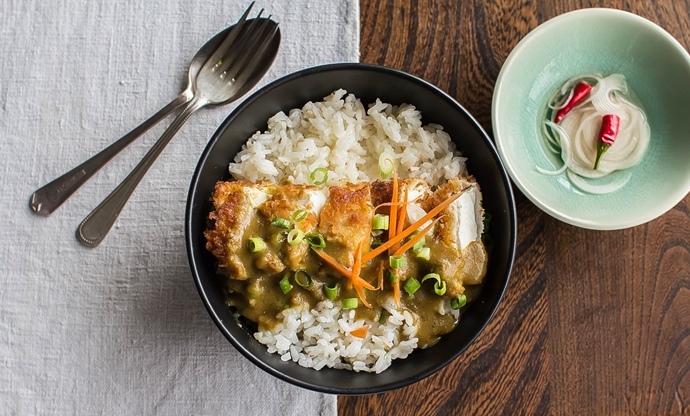 Katsu curry is breaded meat or tofu shallow-fried and served on a bed of rice with curry sauce on top. Curry can also be added to many other Japanese dishes like soups. Katsu karē (curry rice served with a breaded pork cutlet on top). Dorai karē (curry-flavoured fried rice, or curry rice with a spiced mince sauce). Maze karē (curry rice served with the sauce and rice already mixed from Osaka). Karē don (curry sauce, thickened and flavoured with mentsuyu or hondashi and served on a bed of rice to give the curry a Japanese character). Aigake (rice served with curry sauce and hayashi sauce, which is made from fried beef and onion, cooked with red wine and demi-glace). Yaki karē (curry rice, topped with a raw egg and baked in an oven, originally from Kitakyushu). Ishiyaki karē (curry sauce with rice served in a heated stone bowl, in a similar way to bibimbap). Sūpu karē (curried soup served with chunky ingredients such as a chicken leg and coarsely-cut vegetables from Hokkaido).